“I have fought, I have cried. I’ve been broke, I’ve been bruised. 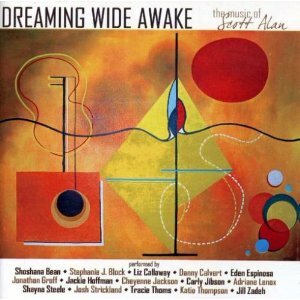 I was recommended this Scott Alan CD, Dreaming Wide Awake, by a reader who like me wasn’t a huge fan of Tim Prottey-Jones’ album which I reviewed last week and claimed that US composers were basically better all round. Whereas that sentiment made me automatically want to not bother, I do love a good recommendation and Scott Alan is one of those composers of whom I’ve heard a fair bit without having actually engaged with his music or any of his shows. Alan is a lyricist and composer who has written a handful of shows but more recently, his output seems to have been channelled into collections of his work on CD: he is now up to his third, of which Dreaming Wide Awake is the first. I’m not going to get sucked into a US/UK debate here, there’s room in my heart to like all sorts of different things for different occasions, but I do have to say that this is an album which pretty much blew me away from first listen. Opening with the punchily brilliant ‘I’m A Star’ by Eden Espinosa, it is clear that Alan is unafraid of showing emotion in all its colours through his writing. I’m A Star is the kind of song to get pulses racing with its determined dreams of success and one I’m surprised I haven’t heard in a cabaret set (yet). Tracie Thoms’ ‘Let Love Begin’ has a driving tunefulness and there’s a great comic number in the countering viewpoints of ‘At Seventeen’. But it is the naked emotionality of many of these songs that really appeals to me, in the little fragments of stories they suggest. Jonathan Groff’s beautifully fragile ‘Now’ is simply gorgeous – and not just because it is so nice to hear a guy singing about a relationship with another guy (even if it is ending) – and just heartbreaking in its all-too-believable tiny details, as well as the grand emotion, of the slow realisation of dealing with a break-up. Danny Calvert’s ‘Kiss the Air’ is perhaps the other side to that song, someone explaining why they are leaving, with heartfelt meaning. The slow build of Adriane Lenox’s ‘Magic’ and Shoshana Bean’s ‘Home’ provide evocative showcases for the delicacy of both the songwriting and these beautiful voices. MD/Arranger/Orchestrator Jesse Vargas has brought in both live strings and brass to give an organic richness to the sound, lending a timeless feel which should stand it in good stead for enduring as it is the kind of album I can imagine putting on again and again and actually listening to from start to finish, which is no small achievement when picking songs out of shows for a collection like this. So I would say this is a CD well worth investing in and I’m rather looking forward to working my way through the next two.